Few types of pizza are as unique and iconic as Chicago-style pizza. 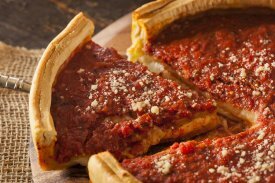 If you’ve never tasted it before, you can try Chicago pizza near San Jose at Pizz’a Chicago . The Windy City’s most famous dish is different than most other types of pizza that you’ll find around the world. Read on to learn a few facts about this unique regional food. Though Chicago was founded in 1833, Chicago pizza wasn’t served in the city until more than a century later. Pizzeria Uno, which opened in 1943, was the first restaurant to ever serve this dish. 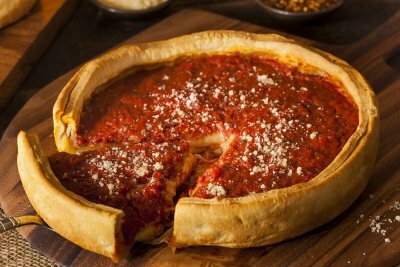 The heirs of the restaurant’s founder Ike Sewell and its chef Rudy Malnati have disputed which of the two men actually invented the deep dish pizza, but both agree that it was first served at Uno’s. In the seven decades that have passed, many more pizzerias serving deep dish have opened in Chicago and all around the country. Thin crust pizzas are usually layered in the following way: crust, sauce, cheese, toppings. But the unique structure of a deep-dish pizza requires a different layering scheme. The thickness of the crust and the depth of the topping layer require much longer baking times than other pizzas, so to prevent the cheese from burning it is laid down first. Then the toppings are added, and finally a layer of tomato sauce on the very top. This construction ensures that the other ingredients don’t charring before the crust is perfectly cooked. Chicago-style pizza has kept up with changing needs and preferences of modern diners. Gluten-free crust is available so that people who choose not to eat gluten or those who suffer from celiac disease or other gluten sensitivities can enjoy deep dish pizza. In California, pizzerias make deep dish with local vegetables to offer diners fresh, healthy toppings. 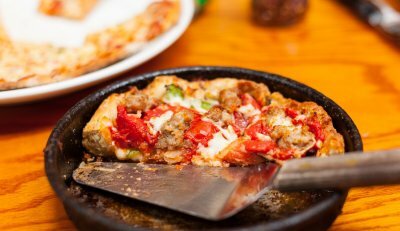 A customized Chicago-style pizza with all your favorite toppings is the perfect delivery or takeout food for the whole family. While cooking your own food can be great, you might not want to spend an hour or more prepping food and standing at the stove if you’ve had an extra stressful or long workday. Ordering a pizza lets you get a delicious, complete meal featuring all your required nutrients and food groups on the table quickly and easily. Choose your toppings carefully, and one slice of pizza can feature every food group. 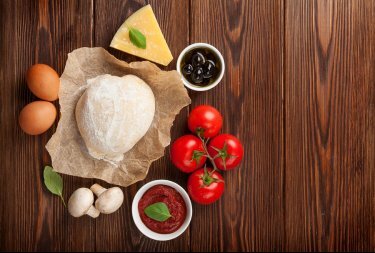 You’ll get carbs and grains from the crust, dairy from the cheese, protein from any meats you order, and vitamins and minerals from the tomato sauce and any fresh veggies you get on your pizza. If you need a gluten-free meal, simply order a pizza made with gluten-free dough. Other types of takeout can create a mess almost as big as cooking can. By the time you’ve unpacked several different styrofoam containers and little plastic cups of sauce, there’s a ton of things to rinse out and put in the recycling. A pizza comes in one box, and you can use your own plates. When ordering deep dish, remember that you’ll need knives and forks too! When you’re done, everything can go in the dishwasher. For many people, pizza is a comfort food that brings back warm childhood memories of pizza parties at school or birthday parties at pizzerias. It’s perfectly okay to order pizza simply because you or someone in your family loves it and has a craving. Whether you are hosting a kid’s birthday celebration, a graduation party, or an informal summer get-together with friends, you can’t go wrong with a pizza party in Palo Alto . With pizza catering, it’s easy to build pies that every guest will love, and since pizza is easy to serve, you won’t have much mess to clean up afterwards. This is especially convenient if you host the pizza party in your own home. The tips below will help you throw the perfect party featuring Chicago-style pizza. Pepperoni is the most popular pizza topping in America, but not every guest will enjoy it. To ensure that you have selections that all your guests will love, send out a quick email to ask everyone you’ve invited about their preferred pizza toppings. Also, leave space for them to indicate any food allergies or sensitivities—you can order vegetarian or gluten-free pizzas, but you’ll need to know ahead of time. Deep-dish pizza is not meant to be eaten with your hands. The unique crust and thick layer of toppings require a knife and fork. Make sure that you have enough plates, knives, and forks for each of your guests, and even a few extra. Also, make sure that everyone has a seat with a table nearby, so they can easily cut their pizza. Everyone doesn’t have to be in the same place in the house, but every seat should be comfortable. Although one slice of deep-dish pizza can be a hearty meal, complete with veggies and nutrients, you should still have a few appetizers and sides available to your guests. Garlic bread and buffalo wings are pizza party staples that pair perfectly with any pie you choose. For a side salad, you can order a huge communal portion of Caesar salad, spinach salad, or the pizzeria’s house salad and guests can serve themselves. For dessert, cheesecake or cookies are both great finishes to a hearty, delicious pizza meal. 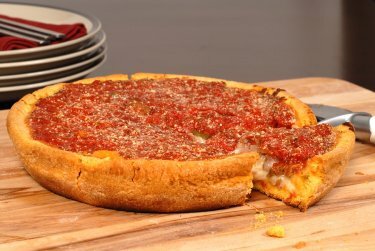 What Makes Chicago-Style Pizza Unique? Pizza took on its modern form more than 100 years ago in Italy, and since then it has spread all over the world. In the U.S., many different cities and regions have their own local versions of pizza, but the two most famous are New York style and Chicago style pizza (also called deep-dish pizza). In Northern California, you can enjoy Chicago-style pizza near Palo Alto at Pizz’a Chicago . Read on to learn more about what makes this type of pizza special. “Pizza pie” is a common term for a whole pizza, but it doesn’t really describe most types of pizza accurately. Italian and New York style pizzas are actually flatbreads with a thin layer of toppings. Chicago pizza, however, is baked in a round pan similar to a pie pan—this is the “deep dish” that gives the pizza its other name. The buttery, rich dough is spread on the bottom of the oiled pan and also worked up the sides, and it is partially baked before toppings are added. It should be crispy, flaky, and rich. Most styles of pizza are assembled in this order: crust, sauce, cheese, toppings. At a Chicago-style pizzeria, however, the construction order is slightly different. Deep dish pizzas require longer times in the oven than thin-crust pizzas, and if the delicious mozzarella cheese was on top and exposed to direct heat for the full baking time, it would burn or become rubbery. Thus, Chicago style pizzas are built in the following order: crust, cheese, toppings, tomato sauce. 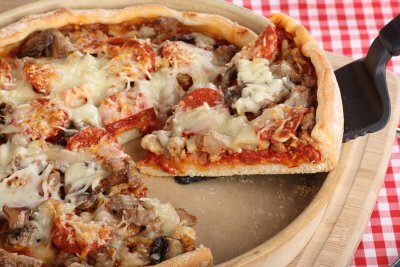 Thin slices of pizza can only hold so many toppings before they collapse or get soggy. But a deep-dish pizza has room for a larger quantity of toppings, because the crust is sturdier. Also, it is meant to be eaten with knife and fork instead of with your hands, so a deep-dish slice can come piled high with different delicious ingredients. At Pizz’a Chicago, we offer a wide range of specialty pies, including vegetarian options, packed with different delicious ingredient combinations. Whether you’re from the east coast, Midwest, or west coast, chances are you’ve heard about the debate over New York versus Chicago-style pizza. Both types of pizza have their fans, but it’s only fair to try both before you decide which you like best. Make sure you get Chicago pizza from an authentic pizzeria in Palo Alto so you can make an informed decision. Watch this video for a look at Chicago pizza as it makes its way to New York. There are some proponents of New York pizza who dismiss Chicago pizza outright—but chances are these people have never even sampled Chicago pizza for themselves. 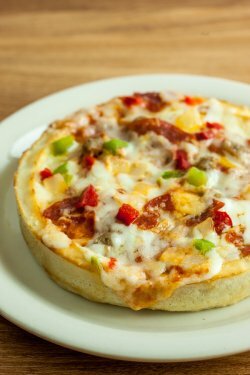 Chicago pizza is known for having a thick crust, cooked in a deep-dish pan that makes it chewy and delicious. New York pizza tends to have a thin crust, and you won’t get as much cheese or as many toppings as you do on a Chicago pizza. You might need a knife and fork to tackle a Chicago pizza, but that doesn’t make it any less of a pizza. No matter how you eat it, you’ll find it to be tasty and satisfying.